Whether you call them huevos rancheros, shakshuka, menemen or,the very familiar to me, strapatsada, eggs in aromatic red tomato sauce are a popular breakfast and meal across the world. The basic principle is to precook a red sauce, most usually with fresh tomatoes, and then to either poach or scramble the eggs in it. I have grown up with the Greek strapatsada as a summer dish or an easy dinner, in fact it is one of the first meals I ever cooked. Whilst strapatsada uses subtle flavours such as green peppers, pepper, basil or parsley and scrambles the eggs with feta cheese, shakshuka gains its distinctive flavour from spices such as (at least) cumin and turmeric, and requires that you poach the eggs towards the end of the cooking process. You can play with this dish endlessly. Add chilli and serve with avocado for a Mexican twist, or use sumac for the scrambled Turkish menemen version. But today I am sharing a version of the dish, closest to shakshuka, which has allowed my Lia’s Kitchen recipe to reach new heights of flavour through the addition of honey mustard and fennel seeds. At the end of this blog entry, in my regular tips section, I give you instructions for a strapatsada in the hope that this will satisfy your Greek cuisine cravings. Pick a pan wide enough to fit your four eggs when you poach them on top of the sauce. Sauté the onion in a couple of tablespoons of oil with a couple of tablespoons of salt and all the spices until translucent. Add the mustard and stir fry for a couple more minutes to release all the aromas. Add the tomatoes, another pinch of salt, the sugar. Stir, cover and cook on low heat for 10-15 minutes or until the juices are almost dry (more time needed for a tin of tomatoes). Break the four eggs carefully on top of the sauce. Lower the heat, cover and cook for 5 minutes or until the top of the eggs steam cooks to a light white. Remove the eggs from heat immediately after you cook to stop the eggs from going firm or serve immediately. It’s not the end of the world if the eggs go firm but this dish is most wonderful with runny poached eggs. The more eggs you poach the wider your cooking pot should be. Serve on sourdough bread. You will not forget me once you have tried this! 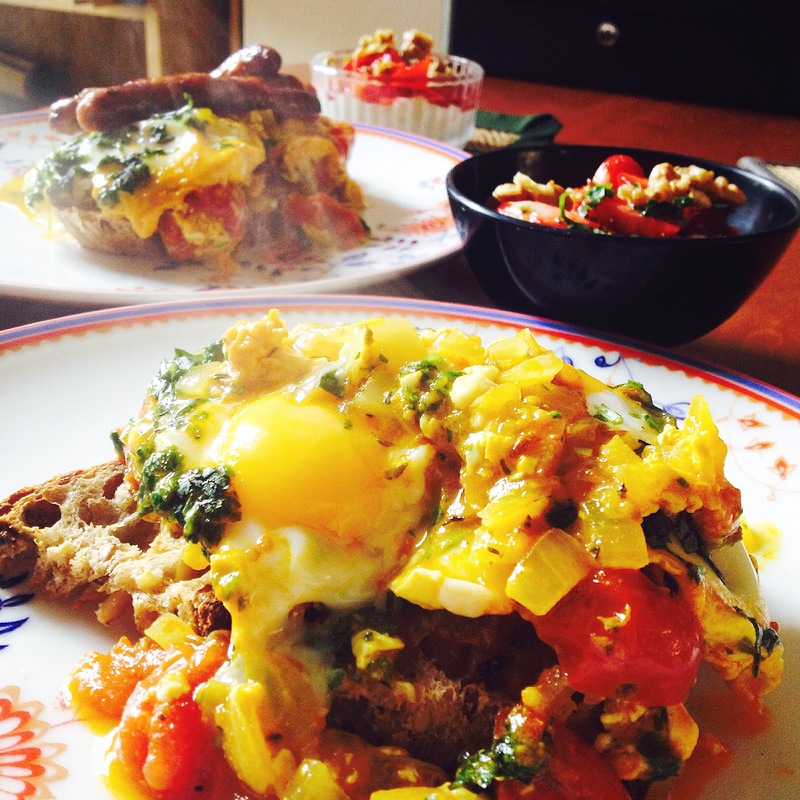 This entry was posted in Greek cuisine, Recipes, Vegetarian and tagged brunch, easyrecipe, eggs, huevos rancheros, lunch, menemen, red tomato sauce, shakshuka, strapatsada, summer recipe.